Mike Huckabee parted with Fox News earlier this year to pursue another White House bid. But after an incendiary remark about the Iran nuclear deal, it's as though the former Arkansas governor never left. On Tuesday, Huckabee appeared on "Outnumbered," Fox's afternoon talk show that features one male guest host with four female panelists. The night before, Huckabee was a guest on the channel's two top-rated programs, "The Five" and "The O'Reilly Factor." 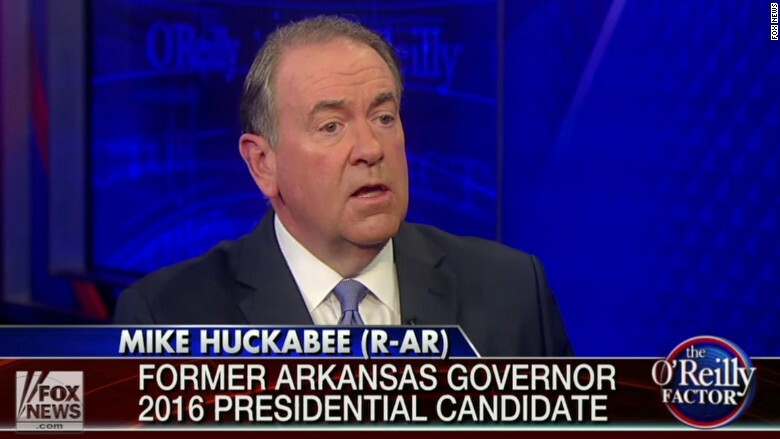 Huckabee showed up on a Fox News web program, too. Huckabee has drawn considerable media attention this week after accusing President Obama of marching Israelis to "the door of the oven" with a tentative deal with Iran meant to prevent it from building a nuclear arsenal. His increased facetime on Fox News, where he hosted a weekend talk show for more than six years, also comes as 16 Republicans jockey to qualify for next month's presidential debate on Fox. He has also appeared on outlets besides Fox. On Tuesday morning, Huckabee stopped by the "Today" show on NBC. The Huckabee campaign did not immediately respond to a CNNMoney request for comment. In each appearance, the candidate stood by his controversial comment that invoked the Holocaust. "Three times I've been to Auschwitz," Huckabee said Monday on Fox, referring to the Nazi concentration camp. "When I talked about the oven door, I have stood at that oven door. I know exactly what it looks like." Huckabee at the Family Leadership Summit earlier this month. Appearing on Fox isn't bad strategy for a Republican candidate. The channel draws an enormous, largely right-leaning audience. According to Pew Research Center, nearly half of people with consistently conservative views cite Fox as their primary source for news on governmental and political affairs. Fox will also host the opening debate on the Republican primary calendar on August 6. The debate will feature only the top 10 GOP candidates in an average of the five most recent national polls. Eager to court the channel's viewers and secure his spot on the debate stage, New Jersey Gov. Chris Christie's campaign recently purchased $250,000 worth of advertising time on Fox. 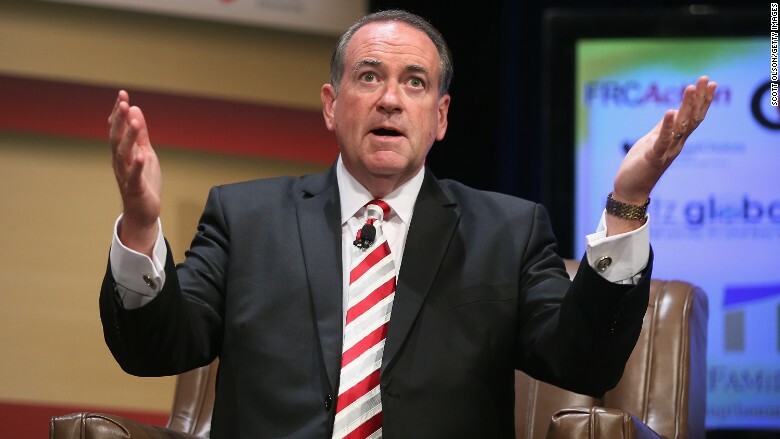 At the moment, Huckabee is positioned to qualify for the Fox debate. He is currently tied for fifth in the Real Clear Politics polling aggregator with an average of 6%, but several other candidates are clustered together within two or three points of him. Despite enjoying a higher name-recognition than many of his Republican rivals, Huckabee has struggled to get much attention for his White House bid. He and other candidates in the GOP's crowded field have been largely overshadowed by the man currently sitting atop those polls, Donald Trump. Trump has dominated most of the headlines with one headline grabbing comment after another -- that is, until Huckabee invoked the Holocaust.